Back in 2004 we had Steve Earle’s “Beatles” album – “The Revolution Starts Now”; then, in 2015, we had his “Blues” album – “Terraplane”. Now we have his latest release, his “Waylon Jennings” album – “So You Wanna Be an Outlaw”. Of course, none of these are an album of covers or an attempt to sound like the artists referenced; it’s more about Steve Earle wearing his influences on his sleeve and specifically acknowledging them in the way he writes and performs for that particular album. So, what you get here are 12 songs, all of which are Earle originals (including a couple of co-writes). There’s perhaps a bit more of a nod to his country roots on these songs than there have been on other recent releases but, beyond that and a lot of twanging telecaster – pick up selector firmly set to Bridge – there’s not a lot to mark this out as an homage to Waylon Jennings per se – but it certainly celebrates the Outlaw movement and the change it brought about on the Nashville music scene. What the album really reminded this reviewer of more than anything else is Earle’s own debut album “Guitar Town”, an album that would probably never have seen the light of day if it wasn’t for Waylon Jennings and Willie Nelson’s Outlaw movement, re-defining the boundaries of country music coming out of Nashville. Recently Earle has been recording in New York but he took himself back to Nashville to record this album – and brought Richard Bennett in to produce it. Bennett was the Associate Producer on Guitar Town and has worked on a number of other album projects with Earle. There’s a real “squaring of the circle” feel about this album. This isn’t the best album Steve Earle has ever made but it is a very interesting one. There are plenty of nods to the Outlaw lifestyle in these songs – life on the road, lost love and loneliness, the feeling of being one of life’s loners. Many of Earle’s songs over the years have carried these themes but you do get the feeling that he’s invested a little more of his own life experience in the songs this time round – you can hear that he’s dredged his memory for stories of those early days, plying his trade around Nashville and meeting his heroes. And his heroes feature strongly in these songs, from Willie Nelson’s great vocal performance on the title track, So You Wannabe An Outlaw, through to a nice nod to Merle Haggard’s Mama Tried in a similarly themed song If Mama Coulda Seen Me. Other Nashville alumni appearing on this album include Miranda Lambert, who duets with Earle on their co-written track, This is How it Ends and the writer of Willie Nelson’s signature song, Whiskey River, singer/songwriter Johnny Bush, who turns in a fine vocal performance on Walkin’ in LA, joined by Reckless Kelly fiddle player Cody Braun. As ever with Earle’s albums, especially in recent years, it’s not just the guest artists that shine. The Dukes are on fine form on this album with The Mastersons, Chris Masterson and Eleanor Whitmore, turning in their usual excellent performances on guitar and fiddle respectively and some outstanding pedal steel work from Ricky Ray Jackson, especially on the opening track. 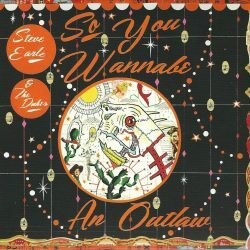 With Kelley Looney on bass, Brad Pemberton on drums and Chris Clarke on keyboards and acoustic guitar the band is a really tight unit that brings out the best in Steve Earle’s Outlaw themed songs. Buy the album for this song alone and then discover all the other good songs on this tribute to Waylon Jennings and the Outlaw movement. Steve Earle pays homage to his greatest influences.